Hands up who eats sushi on the run, out of a brown paper bag or straight from the plastic containers they come in? If you've ever tried to mix the wasabi and soy sauce in one of those, you'll understand it's no mean feat. Enter Kappaya. 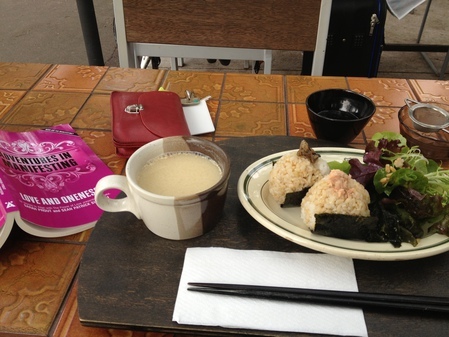 A Japanese soul food cafe located in the picturesque grounds of the iconic Abbotsford Convent. With spring in full bloom (well,almost - come on 25C weather! ), this is a quaint little spot to sit down, order a sushi set and bask in the hubbub and sun. Kappaya serves sushi with a twist. For starters, they are generous sized domes - filled with different flavours. I chose one salmon and one eggplant with mince. I am not sure which was my favourite, I'll need to go back and decide! This crisp green salad with zingy dressing is a light and refreshing complement. As a fan of miso, I loved the ceramic mug it came in. Wholesome and creamy, it was a lovely change from the watery versions some places serve. It's a great spot to sit on a large wooden bench, under the trees and enjoy lunch and homely service. For a birds-eye view - there's a bench close to the cafe goings on, where if you are dining alone - you're bound to meet a friendly face or two. Insider tip: Try the roasted brown rice tea. It's a heavenly finish to an authentic meal. Kappaya is located at 1 St Heliers Street, Abbotsford. It is part of the Abbotsford Convent.